Mike Konczal assembles some striking quotes from Federal Reserve transcripts showing how obsessed the monetary overlords are with keeping wages down. I won’t recycle any of the quotes—check out his post for the full flavor. Reading these, Mike wonders what the contribution of the Fed has been to wage stagnation over the last few decades. My sense is, not much since Volcker left in 1987. There’s no doubt that the Volcker crackdown of 1979–82, with a second-wave attack in 1984–85, did cause a major shift in the relative power of capital and labor. What employers saw as a frightening insolence among the working class in the 1970s was broken by the early 1980s recession—a point that Reagan underscored by firing the air traffic controllers and replacing them. Employers got the message that it was ok to bust unions, and they did with great fervor. The expansion that followed that recession, though marked by decent employment gains, was accompanied by a massive wave of Wall Street-led takeovers and restructurings. Mass layoffs even in relatively good times became routine. And this had an effect on worker consciousness: they’d agree to anything the boss demanded, lest the plant be closed and the work shifted elsewhere. And sometimes even if they agreed, the plant would be closed eventually anyway. With Greenspan’s ascension to the Fed chair in 1987, the business of the central bank became less one of controlling inflation—which means constant wage vigilance—and instead one of cleaning up the messes that financiers created. Cleaning up financiers’ messes meant a bias towards low interest rates, not tightness. 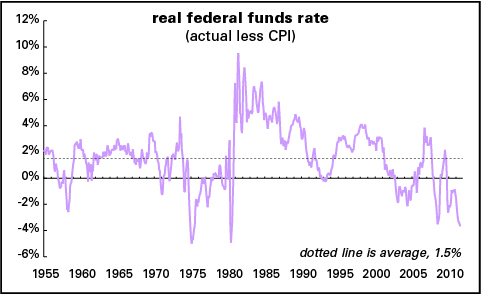 Here’s a graph of the real federal funds rate since 1955. Real means the actual rate less inflation over the previous year. The federal funds rate is the interest rate that banks charge each other for overnight loans; it’s the Fed’s main policy target, and the rate under its most direct control. Over the long term, it’s averaged 1.5%. (That was also its average during the Golden Age, from 1955–73. Note that real fed funds stayed above the average line for almost the entire 1960–73 period, the really fat years for the American working class.) During the Volcker days, October 1979– August 1987, it averaged three times the 1.5% mean. During the Greenspan era, August 1987–January 2006, it averaged 1.6%, just 0.1 point above dotted line. There were periods of tightness, like the late 1980s and late 1990s, but they weren’t all that different from the pre-Volcker patterns. Several years ago I suggested that worker insecurity might be an important reason for unusually damped inflation. From the early 1990s through 1996, survey results indicated that workers were becoming much more concerned about being laid off. Workers’ underlying fear of technology-driven job obsolescence, and hence willingness to stress job security over wage increases, appeared to have suppressed labor cost pressures despite a reduced unemployment rate. At the time of that testimony, in 1999, he was worried that that effect might be ebbing, with a 4% unemployment rate. So policy was tightened—until the dot.com bubble burst. Once there was a financiers’ mess to clean up, interest rates were cut dramatically. So I’d say that the Fed hasn’t really had to tighten to keep wages down in almost 25 years. The “real sector”—the absence of unions, the low and eroding value of the minimum wage, the threat of outsourcing, and all the other familiar weapons of the class war from above—have been doing their work for them. Should that change, the Fed will be vigilant at heading off the threat of “wage inflation”—meaning raising interest rates to jack up the unemployment rate, thereby inducing the appropriate level of worker anxiety. But right now it has its hands full trying to keep the world from falling further apart, which is why we have a real fed funds rate of around –4%. If the ‘real fed funds rate’ is -4%, doesn’t that mean that the quantitative easing tap is dripping a more or less constant flow of newly printed dollars into circulation? All massive disinflationary forced feeding on each other. These are not about to change quickly – note still massive labour arbitrage gap in other Asian countries like Philippines, Indonesia, Vietnam even as Chinese wages rise.